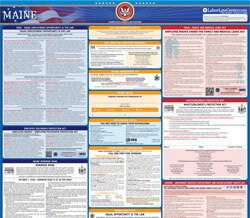 The Maine Human Rights Act - Equal Employment Rights is an equal opportunity law poster by the Maine Department Of Labor. This is an optional poster, so while it is recommended that you post this if it is relevant to your employees, you are not required to by the Department Of Labor. This poster is optional to post and describes the right that employees and potential employees have to be free from any kind of discrimination and who to contact should an employee or potential employee has been discriminated against. It appears you don't have a PDF plugin for this browser. Please see the link below to download maine-eeoposter.pdf. disability, genetic information, religion, ancestry or national origin. employer under the Workers’ Compensation Act or retaliation under the Whistleblowers’ Protection Act. orientation, physical or mental disability, religion, age, ancestry or national origin is a civil right.  Fail or refuse to hire or otherwise discriminate against an applicant for employment. conditions or privileges of employment. opposed a violation of the Maine Human Rights Act.